The deadline for the Jameson First Shot competition, January 2nd 2014 17:00 GMT, is approaching fast. The two South Africans who have been among the winners of the past competitions are Hanneke Schutte and Alan Shelley. You could be next. To watch their entries go to the official Jameson First Shot competition website. "Do the best you can do to give audiences something that maybe they haven't seen before," Kevin Spacey. Kevin Spacey and Trigger Street Productions are looking for more outstanding writer/directors to enter the 2014 competition, where they will be offering an incredible opportunity; giving people a ‘first shot’ in the film industry by having their short film produced by the Academy Award-winning Trigger Street Productions and giving them the chance to direct Uma Thurman in the leading role. In order to enter you must be from South Africa, Russia or the US (now including California! ), be at least 25 years-old, and write a script of no more than seven pages based on one of three themes (‘Legendary’ OR ‘Humorous’ OR a ‘Very Tall Tale’). An expert team, including Kevin Spacey, Dana Brunetti and Uma Thurman who will star in the films, will judge the scripts and the finalist’s shortlisted scenes. The judges are looking for freshness, originality, good structure, good shots, good sound and above all, a great story. From the scripts sent in by the closing date, a shortlist of candidates from each country – South Africa, Russia and the US (now including California) – will be chosen. Each shortlisted candidate will be required to further showcase their talent and capabilities. They will be asked to supply a video bio, a director’s treatment of their submitted script, and choose one of three scripts provided by Trigger Street to shoot footage based on or following on from the scene provided. 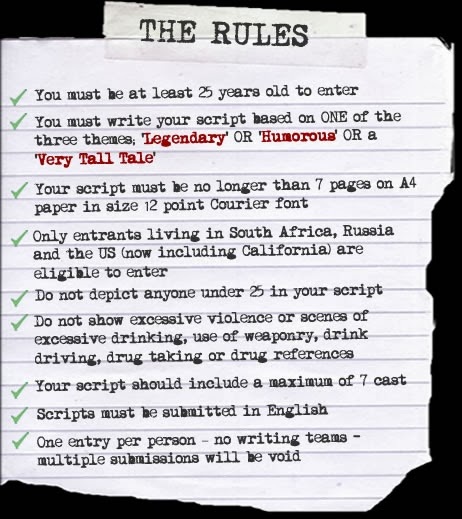 Jameson First Shot comes with an incredible prize where one winner from each country will have their script made into a short film by Trigger Street Productions, starring Uma Thurman. This is an opportunity where you get to call the shots, direct a Hollywood star in your short film and have the backing of an award-winning production company. You couldn’t ask for more from a first shot. For more information on the Terms and Conditions and to enter, go to their website by clicking here.